The base card design is a step up from similar products like Prestige and Rookies & Stars, one of the best parts is that the set photography captures every player in their 2010-11 NBA uniforms. As with most Panini products, the non-auto/relic inserts leave much to be desired, the only exception being the imaginative "Team Threads" die-cut jersey inserts, which are cut to scale and first introduced last season. By far, the standout cards from Threads are the base rookie autos, which feature an on-wood auto and are without a doubt the coolest looking cards of the young basketball card season. They remind me of one of my favorite 90's insert sets, 1996-97 Topps "Youth Quakes", which were also made of wood. 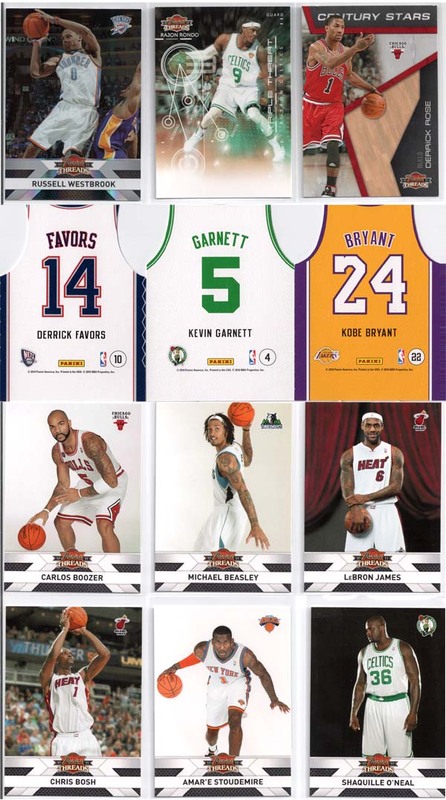 The checklist is definitely an upgrade from previous 2010-11 basketball card products, as it features players both big and small in their new uniforms. The best part about the checklist is that each of the 38 wood rookie autos are within the base set, meaning they qualify as true rookie cards. Per usual, the non-auto/relic insert checklists are odd and uncollectible, for instance, Chris Kaman somehow found a place in the "Century Stars" insert set. There's only one non-auto/relic insert set that is collectible, that being the "Team Threads Home and Away" die-cut jersey cards (not actual relic cards, cards that are cut into the shape of a jersey). I think kids will especially enjoy collecting these. 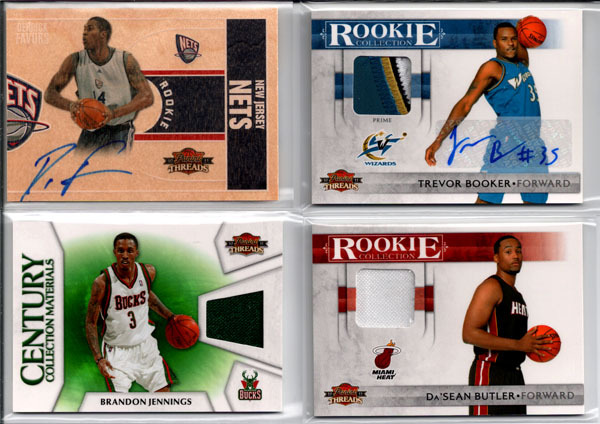 The $80-$90 price point combined with the on-card wood rookie autos make Threads the best bang for you buck box of the young basketball card season. I would be absolutely shocked if the wood rookie autos didn't make a huge splash in secondary market, they are simply to cool to avoid a collector frenzy. What's great is that each hobby box delivers 1 wood rookie auto on average, which makes it a fairly safe investment. On top of that, odds are that you will get some sort of insert auto/patch auto featuring a 2010-11 rookie as one of your remaining three hits, the other two being jersey cards. By far the most fun I've had opening a box of 2010-11 basketball cards. The imagination of Threads is absolutely infectious and although the product does have it's bad moments and lacks polish in some areas, those are alleviated by the presence of the wood rookie autos, "Team Threads" die-cut jerseys and a very respectable box price of $80-$90. If you enjoy products that take cards in a fresh direction, I would definitely recommend breaking a box or two. Threads is without a doubt my favorite product of the young basketball card season. The introduction of wood stocked base rookie autographs was pure genius, with this addition a new tradition was born, one with the potential to become a hobby classic for years to come. I would recommend Threads over Rookies & Stars, Prestige, and Limited without thinking twice. If you have any interest in basketball cards, I would highly recommend looking into Threads, it's one of the most imaginative and infectious products I've opened this year.